I’ve been regrouping, reclaiming time, recalculating, rescheduling, and happily, writing. 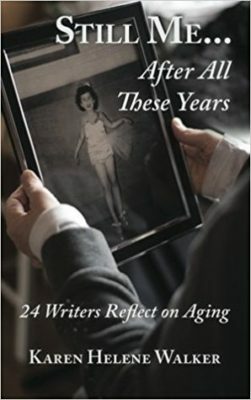 Getting my feet wet again with the essay in the anthology Still Me…After All These Years: 24 Writers Reflect on Aging made me eager to return to the writing life–a little older, and hopefully a little wiser about things such as time management. Getting back into the writing life after a couple of years focused on family issues, getting my knee fixed, and other activities feels like a major transition. Almost like starting over. And because I write mostly crime fiction, I really am starting over this year. My last book with Five Star will be published in their Frontier Fiction line because it’s historical. My contemporary crime fiction manuscripts in the works will need a new publisher. Five Star recently dropped their mystery line, retaining only the historicals and westerns. My one historical novel, the one I consider the novel of my heart, will possibly be the only book I write that’s not set in today’s world. I say possibly, because I never know what idea will present itself next. Meanwhile, I have two full first drafts to work on and a new project started that I really like. I plan to finish that new first draft before going back to the others for revisions, self-editing, and submission. It would be nice to finally finish something. I haven’t done that for quite a while. Wishing Caswell Dead is the historical mystery that’s scheduled for release in November. I expect to have cover art soon. That’s when I’ll really get excited. It never seems real until I see the cover. And by the way, Wishing Caswell Dead is the novel I started back in 2007 while waiting for The Prairie Grass Murders to be released. I wrote five versions of WCD over the years, completed The Desert Hedge Murders and Dead Wrong and saw them through publication, then finally went back to version three of WCD to fix and submit. One thing writers need in abundance is perseverance. Another is patience. What other qualities do you think writers need to survive the writing life? I’m a Guest at JC Lynne’s Blog This Week!